Mount Pinatubo is an active volcano. It is located in the Luzon Island in the Philippines. It is classified as a stratovolcano as it has tall and steep sides which are formed from layers of volcanic ash, pumice and hardened lava. An eruption took place on this volcano on June 15, 1991 which was considered one of the largest eruptions in the 20th century. The eruption was preceded by many earthquakes north of the Pinatubo and a lake was formed in the crater which is known as Lake Pinatubo. With an elevation of 1,486 meters, Mount Pinatubo is composed of andesite and dacite. The ash cloud formed after the 1991 eruption covered an area of more than 100,000 square kilometers. This volcano was formed in two stages. The ancient Pinatubo started to form about 1 million years ago. Activity of the ancient volcano ended several thousand years before the caldera-forming eruption and initial growth of the modern Pinatubo. This caldera has been formed exactly where the central cone was before the eruption. The volcano was inconspicuous and heavily eroded before 1991. It was covered with dense forest. There were 847 deaths around the time of the eruption and most of them died in landslides and lahars afterwards. The after effects of the eruption included lowered temperatures all over the world in 1992 and 1993. Declan, Tobin. " 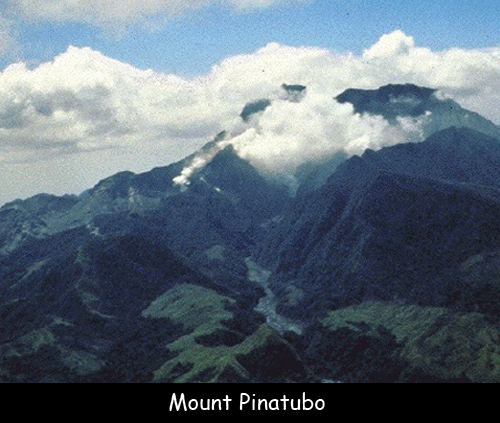 Facts for Kids about Mount Pinatubo ." Easy Science for Kids, Apr 2019. Web. 21 Apr 2019. < https://easyscienceforkids.com/mount-pinatubo/ >.